Discovery Channel broadcasted a 2 hour special show on sunday called "Eaten Alive" in US. 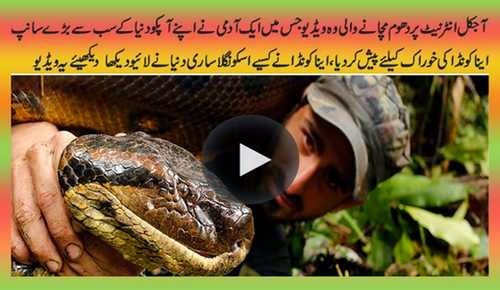 A 27-year-old man named Paul Rosolie who is a naturalist by profession let himself to eat alive by giant 20 feet amazon green Anaconda. Paul Rosolie was researching in the western Amazon more than a decade on green anaconda, the largest and most powerful snake in the world and the top predator in the Amazon. His efforts have helped bring awareness to the Peruvian Rainforest, the natural habitat of the giant green anaconda. He decide to make a stunt in which he fed himself to giant anaconda. Discovery channel has been announcing a special called Eaten Alive over the last month, and it finally broadcast on sunday night. Discovery crew chosen a giant snake for eaten alive stunt and provide a full protective suit to Paul Rosolie. What happened next watch this whole stunt video.